Dark skin patches result from clumps of excess melanin, the skin's brown pigment, explains the American Osteopathic College of Dermatology. The condition is known as hyperpigmentation, and may result from a variety of causes. True hyperpigmentation is typically not an indication of a serious medical condition, reassures Medline Plus. However, newly-formed irregularities in skin's appearance are a warning sign of skin cancer, so they should be evaluated by a dermatologist. Solar lentigines, otherwise known as age spots, sun spots or liver spots, usually appear as oval-shaped dark areas of skin. These are a common type of hyperpigmentation, generally appearing around middle age, according to The Merck Manuals Online Medical Library. Solar lentigines form in reaction to many years of unprotected sun exposure. Hence, they most often appear on areas of the body that get the most sun, including the hands, neck, forearms and shoulders. When dark patches are localized, the most common cause is post-inflammatory skin damage, states The Merck Manuals Online Medical Library. Acne, abrasions, burns and other skin injuries and sources of inflammation can leave permanent dark spots on the skin. Melasma is a condition causing large areas of darkly discolored skin. Discoloration due to melasma typically manifests on the face, has distinct borders and displays fairly symmetrically, notes The Merck Manuals Online Library. Chloasma is the same condition when it appears as a symptom of pregnancy. Most melasma forms as a result of hormonal changes, such as those associated with pregnancy and use of oral contraceptives. Sun exposure, thyroid disorders and medications that cause sensitivity to sunlight can contribute to melasma as well, adds Merck. Photosensitivity, or an increased sensitivity to sunlight, is a cause of dark patches of skin. The condition may be associated with ongoing use of medications for which it is a side effect, notes MedlinePlus, such as topical acne treatments. Cosmetic procedures such as chemical peels, dermabrasion and laser skin resurfacing can also greatly increase the skin's sensitivity to sunlight, and treated areas are prone to excessive darkening. Acanthosis nigricans is a disorder that causes dark, thickened, velvety patches of skin, primarily in skin creases and folds. 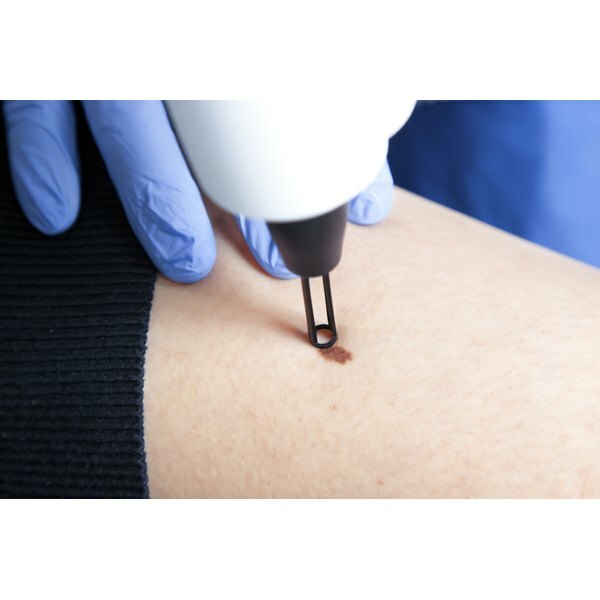 It is most often related to insulin resistance, and is usually seen in those with conditions such as obesity and diabetes that affect this factor, explains the New Zealand Dermatological Society. Endocrine disorders, such as Addison's disease, are known to cause dark areas of skin discoloration, says MedlinePlus. Primary biliary cirrhosis of the liver and hemochromatosis, a genetic disorder resulting in excessive accumulations of iron that damage tissue, can also cause skin discoloration, according to The Merck Manuals Online Medical Library. What Is the Difference Between Vitiligo & Leukoderma?